Big news!! Persimmon Tree is changing its editorship, beginning with the next issue. The current issue of the magazine is my last one as chief editor. (See my nonfiction piece, “Change and All That,” for a fuller description of how this came to be.) With the exception of Marcia Freedman, who thankfully will stay on as the magazine’s marketing / fundraising director, and Gena Raps, who will continue as the music editor, the current contributing editors and I will be leaving. We have a great new editorial team coming on board: Sue Leonard, who lives in New York, will be our new editor, and she already has selected a group of contributing editors from that area to bring new ideas to the magazine. Wendy Barker, a poet in San Antonio, TX, will be the new poetry editor. You’ll be hearing from Sue and her team in upcoming issues. In the meanwhile, I want to thank those contributing editors who have worked so hard with me over the past five years and who are leaving. What an enormous contribution they have made! They enthusiastically participated in monthly meetings during which we brainstormed about the magazine’s direction and contents. Persimmon Tree in its current form wouldn’t have been possible without them. Chana Bloch, poet, has been our poetry editor. 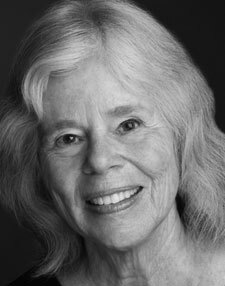 Her vision and connections brought us such fine poets as Ruth Stone, Tess Gallagher, and Sandra Gilbert (see their poetry in the Archive). She also organized the biannual poetry contests, which have become such a favorite of our readers. Martha Boesing, performance artist, encouraged us to add plays and videos to the magazine, and she didn’t let us forget the importance of including a geographically diverse group of writers and artists. Sandy Boucher, writer, was the magazine’s excellent assistant editor for three years. She read submissions, edited pieces, and handled correspondence. Some of you probably know her from your contact about submissions. Sandra Butler, writer, was our all-around reader of submissions and giver of feedback. She also chose the selections that appeared in Short Takes. I also want to thank Marcia Freedman, who will be continuing even though she lives in the Bay Area. We are so grateful to her for creating and organizing the ARTS MART and having the vision to make the magazine self-supporting through its reader gifts and income from ads. And thanks, too, to Gina Raps, for her contribution as music editor. We’re glad both women will be part of Sue Leonard’s team. I want to say a special thank you to our wonderful web programmer, Laura Laytham Zaki. Without her, we’d be in deep trouble. Not only is she adept at web programming but she catches tiny errors in language and is a whiz at artistic presentation. Fortunately for the new editors of Persimmon Tree, Laura will continue in her role. When we started the magazine in 2007, I had no idea it would grow so quickly, attracting readers around the world. I believed there was a need for it since the contributions of women over sixty are too often ignored. The time seemed to be right since people were becoming increasingly comfortable reading literary work online. But the magazine grew as it did because of you, our readers. You spread the word about it, and we thank you so very much. We hope you continue to help the magazine grow by referring it to your colleagues, friends, and organizations in the years ahead. The emails we received from readers, sending us support, appreciation, and ideas for improvement. Keep up your support of Sue by emailing her ateditor@persimmontree.org. The never-empty submissions pile. Even though sometimes I was overwhelmed by the number, the wisdom and creativity revealed in the writing often astounded and moved me. The thrill of publishing emerging writers. Some of our best fiction and nonfiction came from women who had never published before or who were just beginning to publish. Putting the issues together. This was my job, and I loved editing and working with authors. The good times we had as a Bay Area editorial board, laughing our way through meetings, bouncing ideas off each other. With thanks to all, I wish you well.